"A lighter version of this classic down-home dish. One of the best comfort foods of all time!" In a large saucepan or Dutch oven, stir together the cream of chicken soup, chicken broth, and milk. Bring to a simmer over medium heat. Heat 1 tablespoon oil in a skillet over medium-high heat. Add chicken strips, onion and celery. Sautee until chicken is cooked through, and onions are tender. Transfer the chicken mixture to the soup pot, and mix well. Reduce heat to low, and simmer for 30 to 45 minutes. Season with celery seed and black pepper. To Make Dumplings: In a medium bowl, stir together the flour, baking powder and salt. In a small bowl, mix together 1/2 cup of milk and 2 tablespoons of oil. Pour into the dry ingredients, stirring just until moistened. Drop tablespoonfuls of the dumpling mixture into simmering chicken stew. Cover pot tightly, and bring to a boil. Simmer for another 12 to 15 minutes - without peeking! Ladle into bowls, and serve hot. 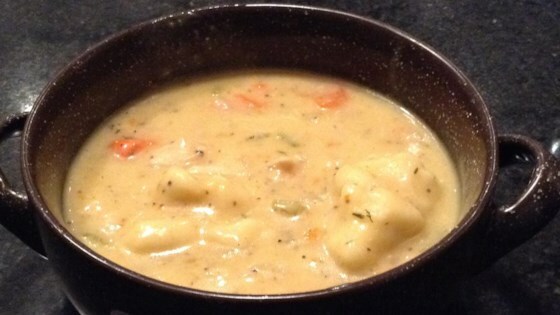 See how to make simple, soul-satisfying chicken and dumplings.